What is going to happen during the 700MHz clearance? To make way for more mobile broadband in 2020, millions of Freeview viewers are going to need to act. A very few will need a new aerial. Will that be you? Back in 2012, the UK completed the switch to digital-only TV to provide greater viewing choice, high definition channels, improved reliability and better picture quality. Digital TV makes much more efficient use of the UHF broadcast frequencies. 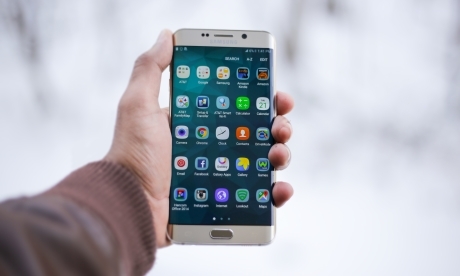 This has meant that nine old frequencies used by TV (C61 to C69) could be sold to Three, EE, Vodafone and O2 for use by mobile phones to access the internet at higher speeds than before. The ever-growing demand for mobile internet - that works reliably when traveling, inside shops and offices - means that Freeview will need to vacate more broadcast channels (C49 to C60) in about four years’ time. This can be done without reducing the available TV and radio channels, but it will mean retunes for all Freeview viewers – and new TV aerials for about 10% of homes in Greater Manchester, Cheshire, Merseyside, Somerset, Bristol, County Durham, Oxfordshire, Dundee, Dover, Carmarthenshire, West Sussex, North Devon, the Scottish Borders and the north of Northern Ireland. These new aerials will be provided and fitted for free. The date for the start of use for 694 MHz and 790 MHz for mobile broadband in the Pan-European frequency allocation area is 30 June 2020. The interim multiplexes will shift to using Single Frequency Network (SFN) on two “700MHz” frequencies – probably channel C51 C55 and C56 at some point between now and 2020. This will be the “first clearance event” and cause some homes to change aerial groups. 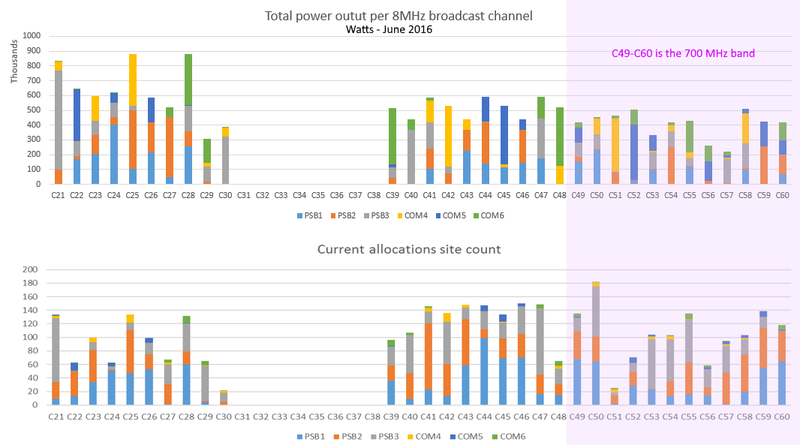 At some point each of the transmitters using the “700MHz” channels – that’s C49 to C60 – will need to find the homes without wideband aerials and have them fitted. There may be a large number to deal with in Manchester and Oxfordshire. C38, which is currently allocated to PMSE – which is mainly “stage” radio microphones and short-distance video outside broadcast links – will need to be used for Freeview. Due to the nature of the industry, this channel may not come available to Freeview until 2020. This might mean a final “clearance event” on this date. Once the mobile broadband services start, homes using C47 and C48 for Freeview in weak Freeview signal areas with masthead amplifiers will need to be dealt with (like “at800”), starting in July 2020. The 700MHz band consists of twelve UHF channel numbers, but there are only seven in the 600MHz band, and one used for PMSE. 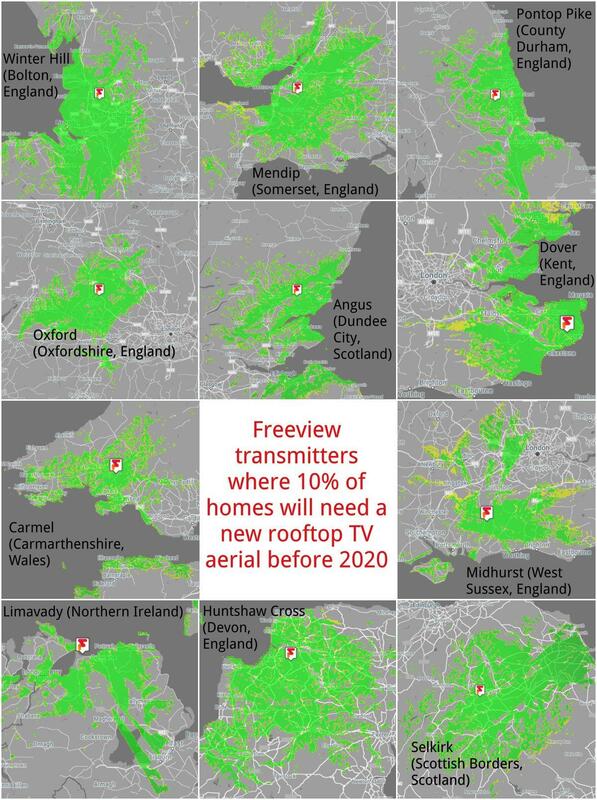 This means that the mapping of frequencies won’t be a simple matter as there will be four less classical Freeview allocations for the same service. How are the current Freeview broadcast frequencies used? Greater London, Lincolnshire, Cumbria, Isle of Wight, Sussex and Hampshire coast, North Yorkshire, Aberdeenshire, eastern Northern Ireland, Cornwall, Fife, Herefordshire, East Ayrshire, South Yorkshire, Newcastle and Stoke-on-Trent. If you run a professional performance venue (for concerts or theater) or make TV (live or recorded) shows you will probably make use of radio microphones or short-distance links for audiovisual. Before 2012 you will have been using “C69” for these, and had to have the equipment changed to C48. Because Freeview is going to work with twelve less broadcasting channels from 2020, it will be necessary to use C48 for Freeview. Also many TV studios (say, Sky News) also make use of unused Freeview channels for radio microphones and they simply won’t be able to find unused channels from mid-2020. Ofcom has provided PMSE new frequencies away from the old TV ones, but this will mean another equipment upgrade as well as using digital technology to make better use of the new band. Since the start of the previous 4G services, a very small number of Freeview viewers have had to fit “filters” or have had their rooftop aerial amplifier removed. This was done by “at800” who provided any home with the necessary equipment for free. The same scheme will be run for those people now in the top band, which is about 1% of Freeview homes, which will then run from July 2020 onwards, presumably as “at700”. What is the schedule for these changes? There are several good reason for leaving the changes until as late as possible: newer Freeview equipment is able to re-tune when network changes happen, and it will take time to locate the actual aerials that will need replacing. The first event will need be a “national retune” for Freeview HD users and those places using C51 (Emley Moor, Dover, Sandy Heath, Redruth, Beacon Hill and others) C55 and C56 (Mendip, Sudbury, Waltham, Huntshaw Cross) effected by the movement of com7 and com8 to a national SFN. No changes will be needed at Cambridge, Channel Islands, East, East Midlands, East Yorkshire and Lincolnshire, London, the rest of Scotland, West Midlands and Yorkshire. In my area "10%" of homes will need new antennas. Who determines whether my home is one of them, and when? Who is responsible for changing the antenna? What happens if a home has more than one antenna? Tom G: The 10% of homes will be determined by which ones are predicted to loose reception following the frequency changes with their currently fitted aerial type. As far as I'm aware no details have yet been announced about how the funding for this will work and who will take responsibility for delivering it. Virtually all indoor aerials are wideband so wouldn't need changing on that basis. Although indoor aerials are only really suitable for use in areas with a strong signal, particularly the loop types that used to be commonly attached to the top of small portable CRT TVs as they aren't polarised and aren't really directional either. I suspect that the press will make a big a deal of this as they did of digital switchover and then 4G. Of course, in neither case did the worst case scenarios (which they themselves pushed) come to pass. As the article above says, most aerials will be fine anyway, and by the time comes, there may actually very few of the older aerials around anyway. Any word on the expected date for switchover from DVB to DVB-T2? Might as well kill two birds with one stone! several mornings a week I seem to lose all itv plus various other channels. it is either scrambled or has a no signal message. On sunday this happened,but had no signal on every channel. I then retuned and it was ok. Monday and today, itv etc have disappeared again. Any ideas. I am a pensioner so definitely cannot afford a new ariel. "Who determines whether my home is one of them, and when? " Before the digital switch-over, you could work out if you needed a new aerial by using a special "Teletext" page. This time they might do it by generating a temporary multiplex service that just consists of a single channel with the simple text saying "you don't need a new aerial". So, you might be asked - by means of publicity - to see if you can see a special Freeview channel (say, "99") to check to see if your aerial is OK.
"Who is responsible for changing the antenna? " This will be a body funded by the costs of taking over the new allocations, as per "at800". "Who pays for changing the antenna? (That's especially important for 4 story houses with no roof access other than by scaffolding!) "
"What happens if a home has more than one antenna? " See section 6.15 of http://stakeholders.ofcom….pdf "12% of households with outdoor aerials have multiple aerials"
Janet Murry: That sounds very annoying. Can you see https://ukfree.tv/knowled…base ? I live in Rochford, SS4 1BQ and receive my signal from Blubell Hill in Kent - at least, that's is where I think it's coming from, the aerial certainly is pointing towards Kent. I have never been able to receive HD stations and the signal is very flakey at the best of times, the EPG is quite often not available for some channels and reception disappears altogether sometimes in bad weather. Will I be effected by these changes? Do I need a different arial to point to other transmitters, London, Anglia etc? Which is ithe best transmitter for me in order to receive HD programmes. David Brigden: Looking at the Digital UK trade prediction for your postcode you would probably be better off pointing your aerial at the Sudbury transmitter to your North. This should give good reception of the main HD channels (assuming your TV or box is actually capable of receiving HD channels - it should have a Freeview HD logo, just saying HD ready isn't enough). Oh end of the world if you cannot get coverage all the time? I hope there are not idiots like that one on the advert on telly with his mates checking his reception all the time. He would,nt be my mate very long or if I had a mallet he might be bed bound a bit. Go out and get a life. When we go out to a restaurant or cinema we leave our mobiles at home. It is wonderful except for the numpties that have theirs still on in the cinema. It is not the end of the world leaving it for a few hours you know. Check our phones when we get in. Ignore half the crap we receive and reply to important ones we miss. I live about two miles from the Crystal Palace mast and can almost never get any HD programmes, and as I live on lower ground but far enough away shouldn't constitute a problem given the distance.